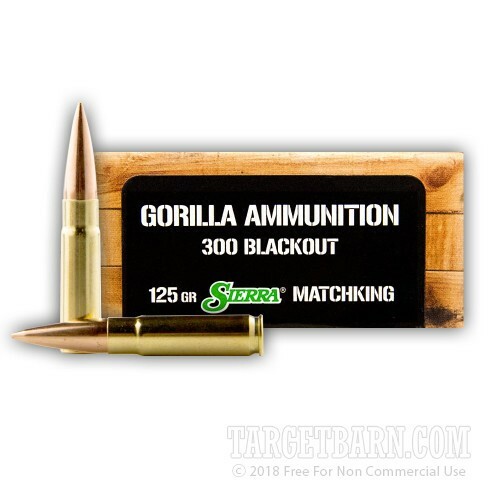 This competition-grade ammo from Gorilla delivers strong, medium range accuracy in your Blackout AR-15 or other 300 AAC rifle. Each cartridge in this 20-round box fires a 125 grain open tipped Sierra MatchKing bullet at 2,160 feet per second. This supersonic muzzle velocity, combined with the streamlined profile and high production quality of the MatchKing, results in excellent medium-range accuracy. 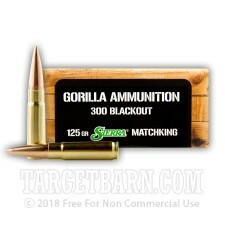 Gorilla ammo is made in Florida using non-corrosive primers and brass cases.